It's been quite a long time and today - April 17th - I can finally launch my Brothers Mod! I feel like I've been working on this one forever. Since I first got my hands on rubix's editor. Then, Doomblade's Challenge Mod came out and became quite an inspiration, as I could not avoid using some of his ideas for names and pictures, specially on weapons and enemies. Later on, as rubix kept developing the editor, I kept making changes to the mod. Battle editor, text editor, graphics/palettes editor...I made good use of them all. But always tried to keep the main focus on this mod: It's not a new game at all. 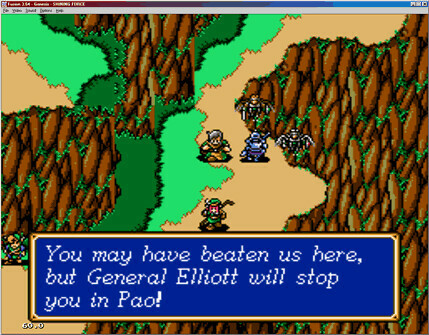 It's just the good and old Shining Force game, only with some minor adjustments. If you're gonna play this one, you will have the same 30 characters going through the same 30 battles. The bosses are the same too. Well, the differences are everywhere. Items, spells, enemies, stats, chests contents... Only, I tried to make them subtile. Tao still casts Blaze and Ken still starts out with a spear. Guntz's still a tank and Torasu is likely to learn Aura 4 if you level him enough. But who knows which of them will learn a brand new spell? And who will get an unusual stat growth curve? Then, I must say the major changes were kept to the battles. Though most of them still get the same kinds of enemies, their numbers and AIs will be much different. And this will make the game a lot harder than the standard one (which is not a surprise indeed). I did playtest it at least four times. And twice since I made last major changes to battles. Last time, I managed to get to chapter 8 without replaying any battle, so I know it's possible. But I must admit I abused savestates sometimes, as I did not have the time nor the will to get Max killed by a double hit at the end of a battle. Hope you will all enjoy Brothers Mod. Feel free to ask questions and post comments in this topic. Thank you everybody, and special thanks to rubixcuber and Doomblade! Fixes to Kane's portrait animation; Vankar's portrait palette and animation; and Some items being dropped by enemies while not supposed to. Fixed an issue with Jogurt's animation. It's December 29th of 2015, more than 3 and 1/2 years since the original launching of this mod. I remember back then I was having a hard time fixing little issues prior to the launching, besides other life demanding tasks, like having a son. Meanwhile, Rubix got really productive on the editor, releasing updates at a pace I couldn't keep up. I always wanted to test some of those features on this mod, but couldn't find the time or will to make it for a long time. Well, I did it lately. I've used that awesome feature from rubixcuber's editor to make Jogurt into a fully playable character. Give him a spot in your party and watch how far he gets! Ever noticed the Land Effect didn't work right? Neither did I. Thanks to rubixcuber's and katgirlfeli's researches, we all got to know that. And thanks to them again, we can now have it fixed and working properly. Ever got tired of passing items around in those rooms filled with chests? 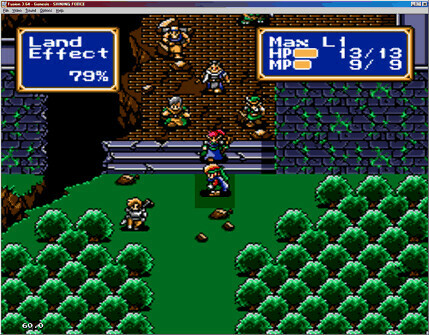 Now the game does it automaticaly, just like in Shining Force II and III. Once a character gains a level, experience is not reseted to 0 anymore. 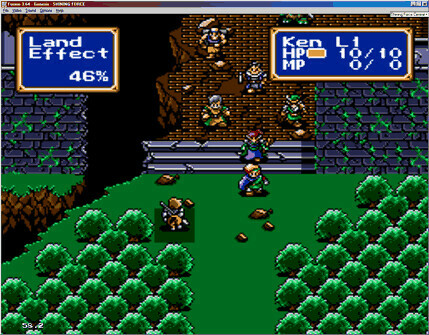 Instead, it's subtracted by 100, just like in Shining Force II and III. Some minor glitches in maps have been fixed. The bottom-left spot in the room above Cave of Darkness is an example. The walkable wall at Bustoke is another one. After lots of complaining about force bankrupting, the economy system has been revised. Enemies give away more money. Weapons and items are more expensive. Reviving and curing cost the same, so they are proportionally cheaper. Also, there's more gold inside chests, so, hopefuly one should be able to revive the whole force after a tough battle. Minor changes in guys like Ken, Luke, Gort, Vankar, Domingo and some others. Well, I hope this is enough to make it worthy to replay and to inspire those who never gave it a try to finaly go for it. And, most of all, hope all the players can enjoy it and have a good time around! - Fixed an issue where itens that were not suposed to be used had been causing game crash when used. As intended from the begining, Power Ring, Shield Ring, Speed Ring and Halberd are now not usable, while the Mobility Ring finaly get to work it's Egress effect. - Heat Axe and Atlas Axe are now breakable itens through use. * Though most characters (maybe all) had some stats revised, the focus was on not to make them very different from what they were originaly. Thus, about 85% of the curves were left unchanged and about 90% of final stats are within +-5 from the original. Last edited by Lobo on Sat Oct 27 2018 12:16pm, edited 31 times in total. I liked the opening, with the minor change to Simone's chatter. Minor glitch: Max can walk through walls at the Force HQ. Major glitch: Max and Ken cannot move or fight. Do you think it might be an issue with Land Effect, which is unusually high for Max and Ken? I'll start over from my save state at Guardiana (GSX) and keep you posted. UPDATE: It looks like the others (Tao, Luke, Lowe, and Hans) are moving about normally on battle 1, with normal Land Effect changes (15% on grass tile, 30% on rocks, 0% on the standard floor in the Gate). All Max can do is Egress out; Ken can't do anything at all. Max and Ken are stuck on their starting positions in the grass (79%/Max, 46%/Ken). I haven't done anything out of the ordinary when I patched the ROM, or saving it. I do notice that you have a sixth Goblin at the battle. Could he have thrown off something? Arrange the team on the grass and have the Force stand their ground there, waiting for the enemies to come to them. Leave Max and Ken on the grass and focus on leveling the charas that can move. The first option's problem is that it leaves Max open to dying. The second option will leave Max and Ken underleveled. Neither of these options will fix the underlying issue, and I'm concerned that it may follow throughout the game. Last edited by acsound on Tue Apr 17 2012 8:38pm, edited 1 time in total. Well, think I already know what it is. I worked the game with my portuguese text all the time, as I was doing both projects at once, and then yesterday I reinserted the english text just before releasing. It just happens that when text inserted for enemies' names exceeds some limit, it just cracks Max's movement. It will be an easy fix and tonight I'll upload the fixed version. I already updated the link in the initial post of the topic. Well, just tell me if you find any other issue. Please disregard my PM response, then; I'll download this patch now. What's going on with the Speed Ring? When I had Tao use it (to Egress, as a Giant Bat had put Max to sleep), it skipped to an enemy's turn (a Sniper who opted to shoot our napping Max). I take it that the Speed Ring does nothing but buff a chara's AGI stat? I'm in Chapter 2: the ever-hated* Rindo chapter. * note: By me, anyway. First is the Desert of DELIGHT, then the Cavern of WONDERS, then Mishaela's MUPPET SHOW, and finally, Darksol's CHAPEL OF THE UNDEAD. Add to that the fact that the mayor won't simply give the Force his last ship, that the townsfolk are fickle with poor taste in theater, and the fact that Mishie incinerates your team's hard-earned ship in an awkward cutscene.... I hate Chapter 2. The Speed Ring is supposed to have no use. So, 'not egressing' is within the plans. But 'skiping to an enenemies turn' is not. I'll look into this issue later on. Right now, just don't use it, as it's not supposed to be usable anyway. I always liked chapter 2. And if nothing else, I always liked the theater and the chapel of undead. Have you enjoyed chapter 1? And how are you doing in battles so far? Too easy? Too hard? Fair challenge? Have been trying this out, just finished the first chapter. Really liking it so far. I Like the higher levels for new characters joining, I always hated having to work on new characters, making them do all the work etc. Doesnt seem much more difficult yet, although chapter 2 will probably be the gauge of that. Is level 10 promoting still possible as I always prefer that, or will that make later battles really hard? "One fine morning, I awoke to discover that, during the night, I had learned to understand the language of birds. I have listened to them ever since. They say: 'Look at me!' or: 'Get out of here!' or: 'Let's f**k!' or: 'Help!' or: 'Hurrah!' or: 'I found a worm!' and that's all they say. And that, when you boil it down, is about all we say. (Which of those things am I saying now?)" Thoth92 wrote: Have been trying this out, just finished the first chapter. Really liking it so far. I Like the higher levels for new characters joining, I always hated having to work on new characters, making them do all the work etc. Lv2 Khris and Lv3 Anri never made any sense to me. Thoth92 wrote: Is level 10 promoting still possible as I always prefer that, or will that make later battles really hard? Yes, it's possible and yes, it will make later battles really hard, but beatable, I hope. I think you can play it the way like. And if I'm wrong, you'll always be able to get help from late characters like Musashi, Hanzou, Adam, Alef and Torasu. Okay regarding the *SPOILER ITEM*. Really, it started with the Freeze 3-spamming Marionette. Chapter 2 is designed to crush you. Hans is starting to fall behind (he only just reached Lv. 6); everyone else is at or approaching Lv. 7. The challenge is good so far. UPDATE: Hans is caught up with most of the team, @ Lv. 8. Khris is a bit behind. It appears that the Power Ring is also meant to simply buff the wearer's ATK stat. Gort loves the Middle Axe. You're right about the Power Ring. And so is the Shield Ring about defense. And "Zappa" is the way his name should be translated from japanese, as you can find in some other topics. I chose to change only Zappa, because I think they meant a tribute to Frank Zappa, as SF3 werewolf is called Fran(c)k.
Haven't tried it on PSP, but it worked fine for me on Gens, Fusion and even on MD.emu for Android. I'm probably doing something dumb with getting the patch to work, but after patching the IPS file and loading the ROM in Gens, nothing happens. The ROM works perfectly fine when unpatched. I'm patching the ROM file with WinIPS 0.64, and playing it on Gens Plus v.0.0.9.61 (I wouldn't be surprised if these were sorely outdated versions of what's currently available). I tried patching it myself using LunarIPS v1.02 and playing it on Kega Fusion v3.64 and it works fine for me. It might be more than likely a bad rom as well. The rom that you use needs to match the rom he used, and a bad dump of a rom will give you poor results. Try getting a rom from another place. I have the same version of Gens+, so it's really not that outdated. Actually I think it is the current version. I don't see it being an emulator problem. It's working pretty fine on my Gens+ 00961. Cullsoft wrote: I'm probably doing something dumb with getting the patch to work, but after patching the IPS file and loading the ROM in Gens, nothing happens. The ROM works perfectly fine when unpatched. As far as ROM patching, I use IPS XP; it looks cartoonish, but works like a dream. I make a copy of my vanilla SF1 ROM, rename the copy to match the IPS patch name, open the IPS patch, pick the renamed ROM copy, and apply the patch. My emulator of choice is KEGA Fusion version 3.64. Works fine for me Culley(there fixed :P). Last edited by ehow22 on Sat Apr 21 2012 3:36pm, edited 1 time in total. To the Pao Bridge/Laser Eye battle: It was extremely tough for me. I could deal with the Peg. Knights, but the Dark Elves would try to pick off anyone trying to camp in the only safe ledge on the bridge (from the Laser Eye). About half of my team died--and that was my second attempt. My first left me with only Max, Lowe, and Amon; Max died and nearly bankrupted the Force. Diane killed the SPOILER Knight and ended this battle. Anyhoo, at least I twice destroyed the Laser Eye (better than my efforts on the Bridge in the Darkwolf Mod (rotten MALEVOLENCE )). Onward to Pao, and welcome to Pelle! Problem sorted - turns out I've been using a lousy ROM dump for the last 12 years. Am currently at the Cave Of Darkness. I like the way that many of the enemies in the battles so far have been rearranged, making them feel more akin to later Force games. Giving the Rune Knights spears certainly made for some interesting changes of tactics on both their and my sides. Oh, and it's Culley, by the way. Good to see that its all working for you. I suppose I should give someone else's mod a try now that mine's been released. Would be a bit relaxing to play someone else's mod than work on my own.